How much warmth does a windshirt add to a down jacket? Home › Forums › Gear Forums › Gear (General) › How much warmth does a windshirt add to a down jacket? I got a Hadron anorak and was chilly resting at camp on a breezy 40F night with a 100wt fleece and cotton t-shirt underneath. Would a windshirt add a significant amount of warmth? I'm thinking I need to go warmer. Maybe the Montbell Highland? 40d and 3oz down sounds pretty good. 650fp though, which would be around 2.3oz of 850fp, so the same as the Hadron. Hmmm. I want a hood and =>30d outer. If you are just sitting around, and it is not breezy, a windshirt is going to add very little comfort. Throw on a down vest under. Borah Gear makes a 3. something ounce vest for only $99. As a warm bodied person, I found the Hadron to be comfortable down to about freezing with just a 200wt wool base layer on when resting at camp. I can imagine if the baffles are sewn through it might keep some warmth in better, and if the wind blows hard you'd have some benefit. If you're really thinking your original jacket is too cold I would either exchange or supplement (layer) with another jacket. Nothing to lose if you have both anyway. It would be like wearing another shirt, adding another layer of air and less penetration. You mentioned that you had a cotton t-shirt on. Cotton can hold some moisture, especially apparent when it's a next-to-skin layer. I would try the same conditions with a mid-weight poly or wool thermal top. You'll probably noticed a difference. 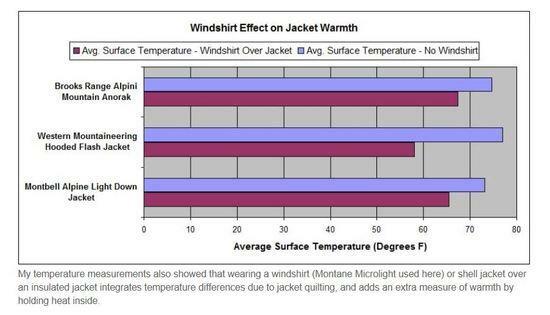 Before Will Rietveld created the above chart, my testing showed that low down fill jackets with lots of sewn-through seams increase their insulation value SIGNIFICANTLY by wearing a windshirt over them. This phenomenon becomes less important as the number of sewn through quilt lines goes down or the fill amount goes up. In advance of testing backpacking jackets for a three part article he would later write, Will exchanged numerous emails with me to discuss testing procedures. One of the tests he agreed to was a windshirt over down insulation augmentation test. The windshirt tests did not involve wind. The windshirt benefit would be even greater in that environment. Note that the outside IR temperature for a perfect insulator would be ambient temp. Will tested near 60F ambient. Note that outside IR temperature for non-existent insulator would be the temperature of the heating pad (Will didn't provide it but it is typically in the 91F – 95F range). Note that Will is only measuring relative warmth because of Newton's Law of Cooling which is logarithmic instead of linear. As the outside jacket surface temperature goes higher the insulation heat loss always increases faster than the temperature increase. 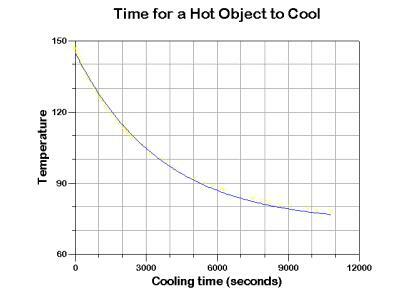 If a heated object is allowed to cool, the rate of cooling at any instant is proportional to the difference between the object's temperature and the ambient (room) temperature. In other words, an object cools faster at first, while it is hot, and the rate of cooling slows down as the temperature of the object approaches the ambient temperature. The function that relates the object's temperature to time is a negative exponential function. So, what was achieved by putting a windshirt over the hooded Flash was a DRAMATIC system insulation improvement even without the added benefit of blocking wind. I agree, the value of a windshirt is not in how much warmth it "adds" but in how much warmth it prevents the wind from stealing away. Richard Nisley–I don't understand this: " (shell jacket) integrates temperature differences due to jacket quilting, and adds an extra measure of warmth by holding heat inside." Don't understand "integrates" usage here. And wonder if the "holding" is more convection (i.e. conduction) blocking or radiant blocking. Very interesting and intuitively believable the effect of a thin extra layer* even without wind. My guess is, the extra air layer created–however poorly supplied with convection beating fibers–is significant. Layers. Am very curious, though,if any deep physics involved. Is not the radiant-loss formula (t1-t2)^3? Big formula. On the face, with space absolute zero, we should be frozen solid….but for the intervening layers of atmosphere, so there are many ts. Is that in effect here? Most of the contribution is through reducing radiant loss via just adding another temperature layer? *I'm always suprised the warming relief I get cold weather camping from just putting my shell on in camp. Was the windshirt used in the testing sized up to fit over the down jacket? People generally carry windshirts that are trim-fitting. I couldn't imagine squeezing my windshirt over my down jacket. I often wear the windshirt under a puffy. No tests done, but it works for me and can hike in early morning this way without getting the puffy damp from sweating. When I warm up I take the puffy off. Who else gets excited when graphs pop up? Thanks Richard. Thanks to everyone else for the tips. I'll have to try out a windshirt tomorrow night when it hits 35F. The Hadron is sewn-through, so I suspect the windshirt will help a lot. lol @ the cotton comments. Hopefully this works, or else I have to go on the jacket hunt again. :( I'll try it with a 200wt fleece, too. You can expect a knock on your door any time now from the BPL police in their ongoing investigation of your elicit cotton usage. If you already have two strikes against you I would consider going into hiding or running for the hills (but not in your cotton shirt, of course, that might make matters worse…).